So many people have raved about the blackberry pie squares I posted a few weeks ago, that I decided to try an adapted version with my homemade cherry pie filling from the fresh sour cherries I picked from my neighbor’s tree. This time I kicked up the flavor with some almond extract, and instead of a white drizzle, I gave the topping a chocolate twist. These were delicious. 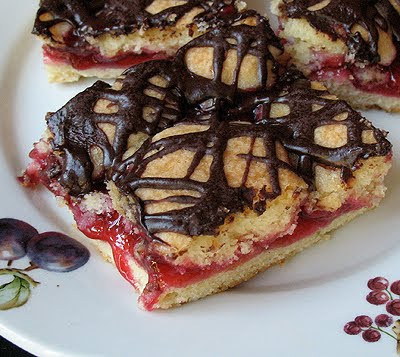 The almond, cherry and chocolate go so well together! The only issue I had was that I must not have spread the pie filling evenly as I ended up with some areas that were dryer than others. I encourage you to try this recipe with whatever flavor pie filling you like. My friend Tami tried them with apple pie filling and said they were wonderful! Ingrid said hers were terrific – she made them with blueberry and added some lemon zest to the sugar mixture before baking. Cream sugar and butter in mixer on medium speed until fluffy. Add eggs, one at a time, until incorporated. Add the almond extract and beat well. Whisk together flour and baking powder. Turn mixer speed down to lowest setting and slowly add flour mixture until completely combined. Spread half of mixture onto an ungreased 15x10 jelly roll pan. Spread pie filling over the top of the batter. Drop remaining batter onto the pie filling layer by spoonfuls. Combine powdered sugar, cocoa, melted margarine and milk and drizzle over warm bars. I don't think I'd have much willpower around your house, with all of these baked goods. These look amazing. Delicious! And with chocolate…what could be better! 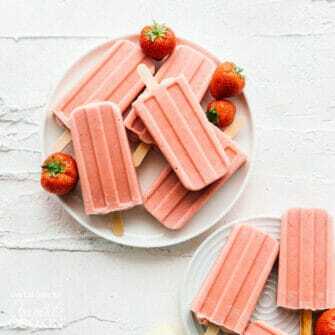 Ahh these look delicious!! 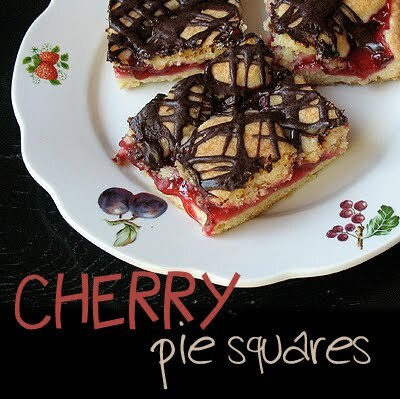 I'm going to try and make these before cherry season is over! What a great idea!! These squares look amazing! 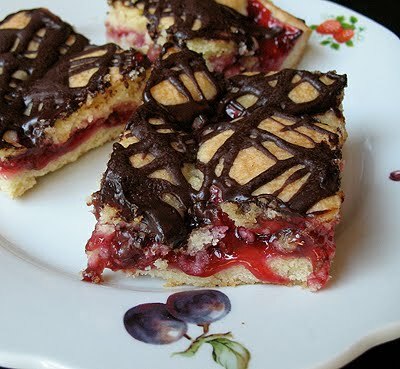 The chocolate and cherries is absolutely delicious – these squares are pure happiness! 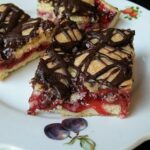 Love the chocolate drizzle on top of these perfect cherry pie squares!